forgotten title, you should find what Scott has to say about it fairly interesting! 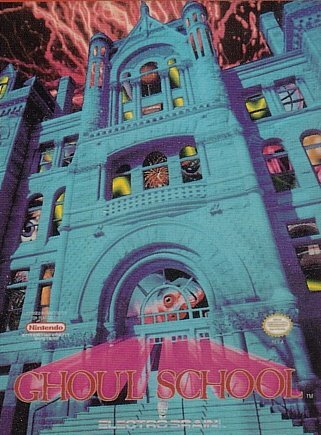 For the readers, what is the full extent of your involvement with Ghoul School? others, and two graphic artists did the artwork. How did you get the game off the ground? executed a contract and schedule. and informed the company's lawyer that there might be a conflict, but he cleared it and we went ahead. "Creep School" was the working title for a short while. the game for, released in 1990. The movie bombed. How were the game's enemies designed? such that it seems like the two of us as a team come up with ideas instead of as individuals. Is there anything more to the monsters that isn't explained in the final game or manual? with the NES and our tight time schedule. took over as the crime family of the school. I don't think I figured that out until now. What are some other early concepts that you had to do away with, for whatever reasons? graphics, not enough time to program. the NES graphics engine to do at the same time it was showing monsters on the ground. What was your idea behind the hero? publicity would offset the loss of sales to racists, but the people putting up the money won that point. The game has quite an odd assortment of weapons. What can you tell us about those? clap together and escape a tight situation in a cloud of chalk dust, and the Fire Hose. hardest to find, it also has a cool sound, look, and animation. syringe is what's pictured in the manual. graphics, the small ROM size, and the time schedule to program it. How was the manual written? illustrations or the box cover design, both of which I think turned out great. How do you respond to criticisms of the game? the play control was downgraded just because it was hard to jump across some of the ledges. particular ideas at the time for merchandise or a cartoon show? cards and party accessories would have been fun. Of the characters/creatures that are in the final game, do you have any favorites? What are your own favorite video games of the past and present? had only one to play on a desert island. Finally, what do you like to do besides your past design and programming work? other thing I like to do -- imagine what the future may bring.